BLADES, Del. 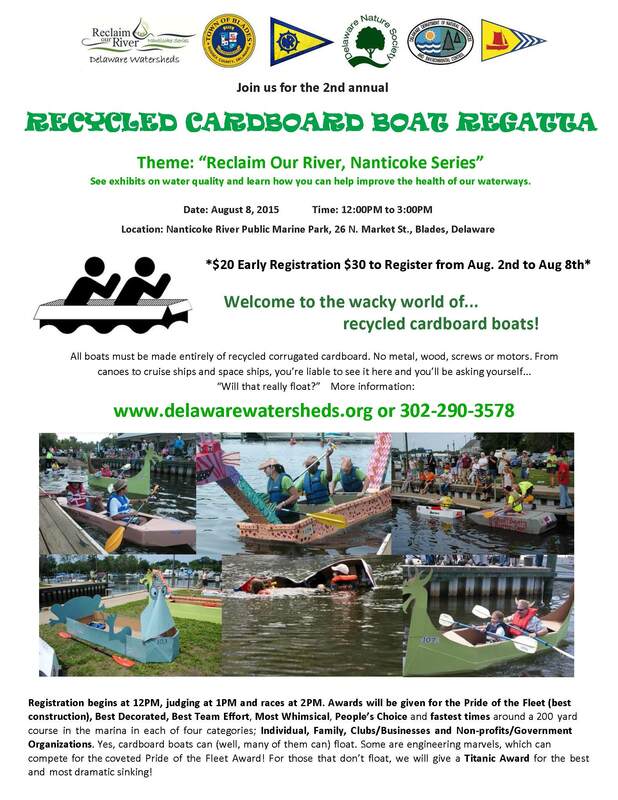 (July 3, 2015) – The Second Annual Recycled Cardboard Boat regatta, presented by the Delaware Nature Society’s Abbott’s Mill Nature Center, in conjunction with the DNREC Division of Watershed Stewardship’s Reclaim Our River Program, the Town of Blades, and the Nanticoke River Sail & Power Squadron will cast off on August 8th at the Nanticoke River Public Marine Park, 26 N. Market St., Blades, DE 19973. The Reclaim Our River (ROR) – Nanticoke Series is devoted to bringing monthly events, workshops and recreational activities to the Nanticoke Watershed. The series offers participants fun opportunities to connect with Delaware’s waterways and provides important information on water quality that can help in protecting aquatic resources. The Recycled Cardboard Boat Regatta is open to anyone who can build a boat from recycled cardboard and paddle it approximately 200 yards to the regatta finish line. First-place awards will be given for winners of races in four different categories: Individual, Family, Clubs and Businesses, and non-profits and government organizations. During the event, attendees can enjoy music by 3CNorth, grilled and baked foods as well as snacks and beverages from the Mt. Olivet Church, and find information from the ROR partnership on how to protect Delaware’s waterways. Interested participants can register the day of the event, but are encouraged to start building their boats as well as registering early for a discounted fee of $20. Registration fee is $30 from Aug. 2nd to Aug. 8th. Sign-in and day-of registration begins at 12PM, initial aesthetic judging will take place at 1PM and races will begin at 2PM. 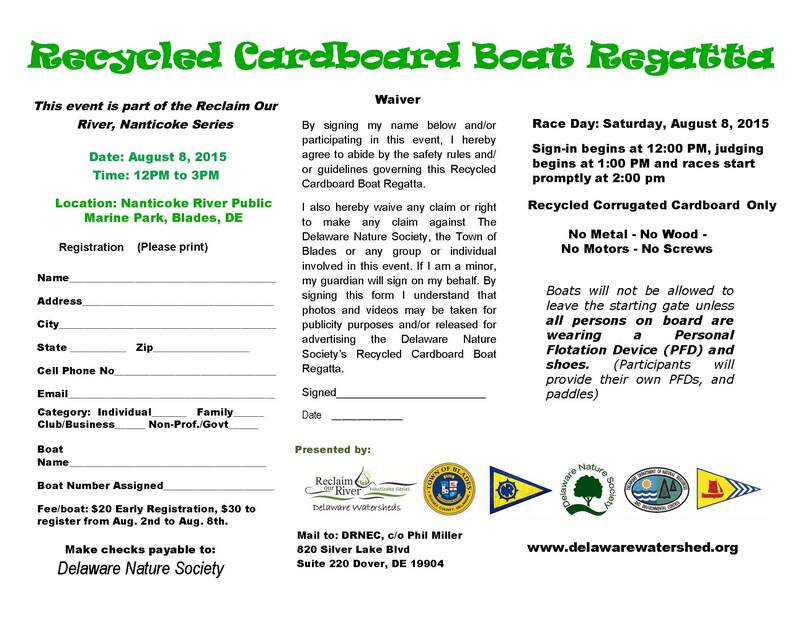 The Recycled Cardboard Boat Regatta is sponsored by Mow-n-Trim and the Nanticoke River Yacht Club. The ROR partnership welcomes additional sponsors of the event with proceeds going toward event costs, river restoration and water quality education. Sponsorships begin at $50.